How the world might have looked 600 million years ago, with Stromatolites (cynaobacteria and perhaps green algae) dominating the coastlines. Multicellular life was just starting to appear on the planet. The earth is very old, 4.6 billion years to be precise: an immense amount of time that is difficult to comprehend. The truth is that after the earth had a chance to settle down from its violent birth, which included coalescing from planetesimals, violent volcanic eruptions, a collision with a Mars-sized object that created the moon, and 300 hundred millions of years of bombardment by massive asteroids, life evolved relatively quickly and appeared after 1.1 billion years. However, it took another 3 billion years for multicellular life to begin. Thus, most of our planet’s history has been dominated by single-celled organisms such as archea, bacteria, including cyanobacteria (blue-green algae), and single-celled creatures (eukaryotes). Now most scientists look to the “Cambrian Explosion” for the beginning of multi-cellular animal life; and rightfully so. It was at that time, about 540 million years ago (mya), that an amazing diversity of animals appeared to explode on the scene, or at least in the fossil record. First documented in the famous Burgess Shale of British Columbia and discussed in Stephen J. Gould’s incredible book Wonderful Life, complex animals appeared to burst onto the planet in an unparalleled record of animal diversity with most of the modern phyla intact. But there is an older, and more recently discovered era, the Ediacaran, that actually represents the earliest appearance of complex life. And it’s a fascinating era with many puzzles. Chief among them are the Rangeomorphs, an enigmatic group of organisms that were ubiquitous in fossil assemblages over 580 mya, 40 million years before the “Cambrian explosion.”. Ediacaran fossil assemblages are common at only a few places: Newfoundland, Arkhangelsk Russia, Namibia and at their namesake in the Ediacaran Hills in South Australia. Although there are differences, each site shows a common architectural organization of a group of critters that lasted for over 30 million years. To call them invertebrates is probably presumptive; they may not even be animals. Their unique frond-like fractal body plan consisting of petals branching off a central axis and occurs across dozens of taxa. Avalon Ediacaran assemblage in eastern Newfoundland. Photo: Steve Piercey. Although they were found in shallow water environments, their structure precludes filter feeding and their occurrence in deep water indicates they may have fed on dissolved organic matter which was common in the microbial-dominated Ediacaran seas. In some cases they occurred at densities and distributions similar to modern-day invertebrate communities with major diversity patterns that exploited resources at different levels about the seafloor. Early forms were simple and prostrate while more derived forms showed a complex, fractal-based structure elevated successively elevated above the substrate. These patterns indicate species were adapted to variation in water flow. Diversity of Rangiomorph morphologies show varying complexity and distance off the seafloor, suggesting their were exploiting different resources. They probably aren’t related to any modern marine life: they are likely an early evolutionary experiment in multicellular life and a stem group branching off just before or after the divergence of animals and fungi (Erwin and Valentine, 2013). Their frond-like morphology is unique: their fractal-based segmented morphology suggest their surface area:volume ratio was constant, unlike modern animals where it decreases with size. Thus, their bodies may have been filled with inert water such as water or sediment to maintain thin tissue contact with the environment (Laflamme et al., 2009). They were common in both shallow- and deep-sea environments: therefore, they could not have used photosynthesis and had no obvious structures for filter feeding so their feeding strategy was enigmatic. They may have fed passively: one hypothesis is they feed by osmotrophy (Laflamme et al., 2009) which involves simple absorption of dissolved organic carbon (DOC) from seawater. DOC may have been 2-3 orders of magnitude higher in the microbial-dominates seas of the Ediacaran and a common source of energy. Their constant surface area: volume area support this possibility. They may not have been animals: one hypotheses suggest they were fungi (Erwin and Valentine, 2013), perhaps even terrestrial lichens (Retallack, 2014), and these were early adaptations to primordial seas and shores. Depiction of Ediacaran Fauna, showing Rangeomorphs and other metazoan taxa. Although there were other multicellular taxa during the Ediacaran period, the Rangeomorphs stand out as a dominant component of that time period that persisted for over 30 million years. During that time we also see the appearance of taxa that show the ancestors of modern animals were clearly present, including the ancestors of sponges, cnidarians, and ctenophores. Other invertebrates, such as Kimberella, a putative ancestral mollusk, indicates that bilaterally symmetric animals were likely on the scene, which eventually gave rise to our vertebrate ancestors in the Cambrian period 20 million years later. But it wasn’t until the Devonian period (120 million year later) that fishes began to dominate the sea. Evolutionary Chart of major Ediacaran taxa. Erwin, D.H., and Valentine, J.W. 2013. The Cambrian Explosion: The Construction of Animal Biodiversity. Roberts and Co., Greenwood Village, CO. xii + 406 p.
Laflamme, M., S. Xiao, and M. Kowalewski. 2009. Osmotrophy in modern Ediarcara organisms. Proc. Nat. Acad, Sci. 106(34); 14438-14443. Liu, A. G., C. G. Kenchington and E. G. Mitchell 2015. Remarkable insights into the paleoecology of the Avalonian Ediacaran macrobiota. Gondwana Res. 27: 1355-1380. Retallack, G. J. 2014. 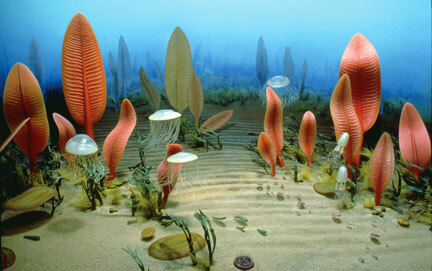 Precambrian life on land. The Paleobotanist 63(2014): 1-15. Valentine, J.W. 2013. 2004. On the Origin of Phyla. University Of Chicago Press. 608 pp.